Fabulous Weekend in Sun Valley – Another Groth Adventure- Check out "March, 2017: Where is he?" Another Groth Adventure- Check out "March, 2017: Where is he?" September: Where is he? Where was he? When will he be in El Paso? Cary, N.C.? NYC? January, 2017- Where is he? February, 2017: Where is he?! First, some information about what “Sun Valley” really is, then photos and a few comments about my wonderful days in Ketchum, Hailey and the Wood River Valley. Sun Valley is a resort city in the westernUnited States. It is within Blaine County in central Idaho. The resort is adjacent to the city of Ketchum and within the greater Wood River valley. The population was 1,406 at the 2010 census, down from 1,427 in 2000. The elevation of Sun Valley (at the Lodge) is 5,920 feet (1,805 m) above sea level. The area is served by Friedman Memorial Airport in Hailey, approximately 15 miles (25 km) south. Visitors to Sun Valley are relatively close to the Sawtooth National Recreation Area, accessed over Galena Summit on Highway 75, the Sawtooth Scenic Byway. 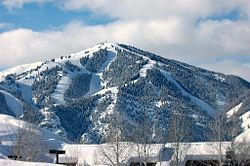 Among skiers, the term “Sun Valley” refers to the alpineski area, which consists of Bald Mountain, the main ski mountain adjacent to Ketchum, and Dollar Mountain, adjacent to Sun Valley, for novice and lower intermediate skiers. Bald Mountain, or “Baldy,” has a summit of 9,150 feet (2,790 m) and a vertical drop of 3,400 feet (1,035 m). With its abundance of constant-pitch terrain, at varying degrees of difficulty, coupled with its substantial vertical drop and absence of wind, Baldy has often been referred to as one of the better ski mountains in the world. 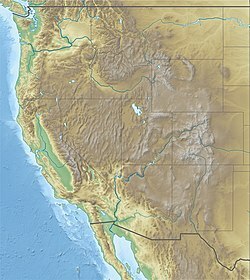 The treeless “Dollar” at 6,638 feet (2,023 m) has a moderate vertical drop of 628 feet (191 m). The term “Sun Valley” is used more generally to speak of the region surrounding the city, including the neighboring city of Ketchum and the Wood River Valley area winding south to Hailey and Bellevue. The region has been a seasonal home to the rich and famous since first being brought to public attention by Ernest Hemingway in the late 1930s. On Friday, February 10th, I drove from McCall, Idaho to Ketchum, Idaho, along the Payette River for part of the day. In August of 2015, I bicycled “Ride Idaho” with 300 other people. On the first day of the week long ride, I met a wonderful group of people from Boise/ Sun Valley. This weekend I reconnected with them and stayed at the home of Rhonda and Howie Schaff in Ketchum. Fresh rolls, which you don’t have to pay for if you eat them while waiting for your French onion soup. Carolyn, Howie and I skied at Billy’s Bridge on Feb.12. After the weekend with Howie and Rhonda, Carolyn and Gary, Claudia and Alex, I had a wonderful evening with Jenny Wayman’s long-time friend, Robbie Cowan, in Hailey. Photos at Starbucks in downtown Ketchum, which I believe is the only chain represented in Ketchum. No McDonald’s, Super 8, Applebee’s, Macy’s, etc. It makes a significant difference in the feel of the community.